Mr Pronto has no trouble when it comes to fixing your beloved sneakers and shoes. Whatever footwear woes you have, look no further than this shop in Forum Mall, Koramangala. 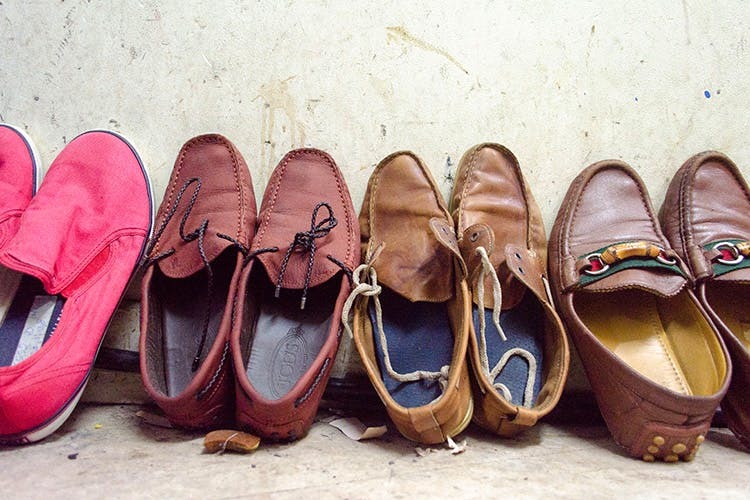 Giving a new lease of life to your favourite pair of footwear is what they do best. A tiny shop on the fourth floor of the mall, you will see rows of shoes lined up for repairs or the ones that have already been cleaned and prepped for use again. From a simple shoe cleaning to thorough stitching to ensure that your shoes remain intact to shoe resizing, be it your loafers, running shoes, sports shoes or formal shoes, there's a lot these guys can do. And that's speaking from experience. The writer's favourite pair of Converse, a limited edition The Simpsons pair, on its last leg was duly stitched up, the sole refitted and looking almost new. And all that cost a mere INR 600. A steal considering, a new pair of Converse will cost you an upwards of INR 2500. Apart from this, the place also repairs bags and trolleys. In case you have a duffel bag that needs to be re-zipped, you know where to go. Last checked, they still do not have a card payment system in place. Be sure to explain exactly what kind of repairs you are looking for as the place offers cleaning/repairing from as little as INR 50 all the way to INR 2,000. It’s okay to spend sometime going over the details as the staff is more than happy to help.